NextEra Energy Partners LP is about to celebrate its fourth anniversary as a publicly traded company. It's already doubled investors' money. 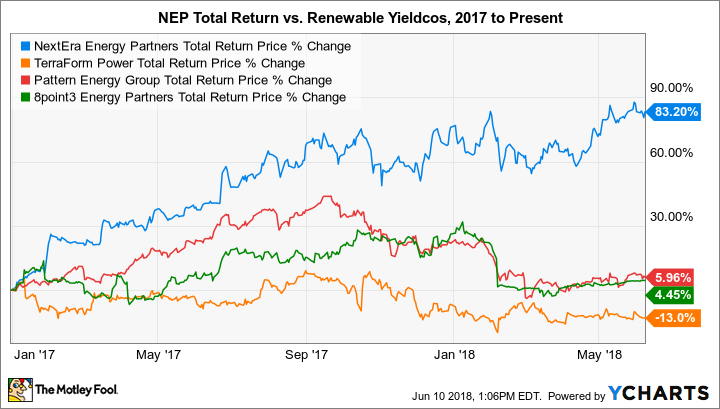 Renewable yieldcos sounded like a good idea when they became a popular investment years ago, but reality hasn't quite lived up to expectations. The idea was simple: Stuff renewable energy assets with long-term contracts into a single portfolio, and then swim in the cash flows powering above-average distributions. The reality was more complicated, as evidenced by the dismal performance of most renewable yieldcos in recent years. That said, one partnership has stood out from the crowd: NextEra Energy Partners LP (NYSE:NEP). That's not surprising considering it has a close affiliation with the world's largest utility by market valuation, NextEra Energy (NYSE:NEE), which doubles as the largest owner of wind and solar farms in the United States. As the partnership turns four years old this month, it's a good time for investors who may have overlooked it to this point to reconsider. NextEra Energy Partners operates as any other renewable yieldco, meaning it acquires energy assets that have predictable long-term cash flow streams and then redistributes the majority of that to unitholders. There are some unique characteristics to the business, however. The first thing investors will notice is that, at 3.8%, the yield of NextEra Energy Partners units is far behind other yieldcos. TerraForm Power yields 7%, Pattern Energy yields 9.2%, and 8point3 Energy Partners yields 9.3%. But when investors consider the total returns (stock returns plus distributions), the comparison isn't even close. NEP Total Return Price data by YCharts. Another thing investors will notice is that NextEra Energy Partners owns natural gas assets in addition to renewables. Considering both will be critical components of America's energy future, that could prove to be an advantage in the long run, especially when considering the geographically favorable distribution of the company's energy assets. Wind: 2,750 megawatts of wind power capacity, 75% of which is located in the highly productive American wind corridor stretching from North Dakota to Texas. Solar: 560 megawatts of solar capacity, all located in sunny southern California. Natural gas: 542 miles of natural gas pipelines with 4 billion cubic feet per day of capacity in southern Texas. Three-quarters of the total capacity is contracted, with three pipelines extending to refinery and export infrastructure along the Gulf Coast and one pipeline exporting directly to Mexico. There's also a 300 megawatt wind farm in Washington State and a concentration of wind and solar farms in Great Lakes region. In other words, NextEra Energy Partners has a diverse portfolio, in terms of both geographic distribution and energy source, with core foundations in the most important energy regions. That provides a great foundation to make high-impact acquisitions to grow for the foreseeable future, although, as discussed below, the partnership's biggest advantage lies in its access to growth projects. Despite only being a publicly traded company since June 2014, NextEra Energy Partners has a pretty impressive track record. That includes growing the distribution 124% and delivering total returns of 100% to unitholders. Having NextEra Energy as a parent has rubbed off, apparently. The partnership expects to grow the distribution by an average of 13.5% per year through at least 2023. Strong growth in the business has powered cash available for distribution (CAFD) higher in recent periods, and recent moves provide confidence that will continue for the foreseeable future. Data source: First-quarter 2018 earnings press release. NextEra Energy Partners recently sold off all of its wind and solar assets in Canada, or about 396 megawatts of installed capacity, for $582 million plus the assumption of $689 million in debt. Management made the decision so it could reinvest the proceeds in projects in the United States, which benefit from the protection of a tax shield for longer and are capable of generating greater returns. The Canadian assets generated a 10-year average CAFD of $38.4 million, which means investors can expect newly acquired assets to top that. That brings investors to the most valuable aspect of the partnership: its close relationship with NextEra Energy and, more specifically, the parent company's generation subsidiary NextEra Energy Resources. As NextEra Energy Resources builds wind and solar farms across the U.S., it will give NextEra Energy Partners the option to acquire certain assets, before shopping them (if it does so at all) to external companies. That's no minor detail. NextEra Energy Resources has a backlog of 28 gigawatts of renewable energy projects spread across the country. By 2020, it plans to grow that to 40 gigawatts. To put that in perspective, the entire U.S. had 121 gigawatts of wind and solar installed at the end of last year. Simply put, there's no better source of renewable assets to purchase than NextEra Energy Resources -- and NextEra Energy Partners is first in line. NextEra Energy Partners doesn't boast the highest yield among its peers, but it does offer the best combination of unit price growth and distribution growth. A coverage ratio of 1.2 times provides confidence that the partnership can hit its long-term targets for increasing the distribution while simultaneously growing its renewable asset base. Considering its close relationship with the largest owner of renewable energy projects on the planet, investors should feel comfortable owning this high-yield renewable energy stock for the long haul.